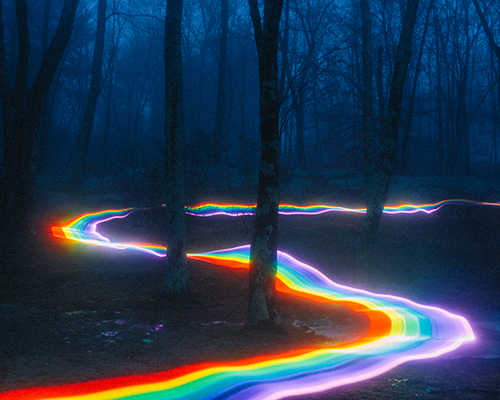 rainbow road roams river bends and rocky creeks. where will it go next? 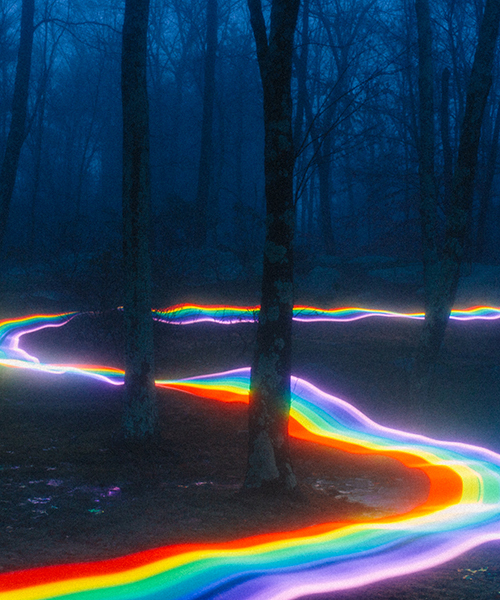 this long exposure light painting is winding around lakes and into the hearts of its followers. breton forms each composition using hand-held illumination and long-exposure photographic techniques, capturing an ephemeral moment surrounded by both natural and urban landscapes. serene natural landscapes and sprawling outdoor panoramas are pierced by the physical addition of glowing geometric forms, korean language characters and butterflies. 'solid one' is a downloadable and printable device, whose lenses permit the multi-dimentional appearance of an otherwise static photograph. by waving an iPhone in the dark, the designer has generated a full font suite and 3D printed letter, with the light streaked icons still visible in the free-flowing characters. 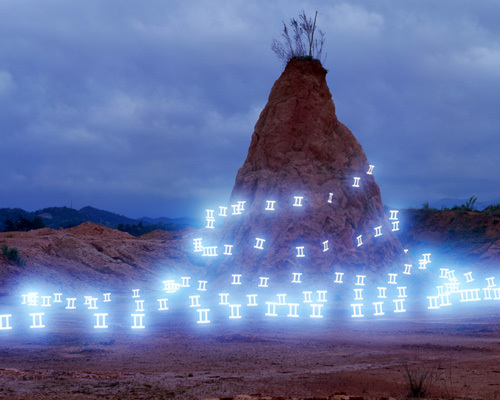 using long exposure photography and stop-frame animation, the project visualizes the electromagnetic fields emitted from objects like computers and radios. in a surreal series free of post-production work, the experimental photographer shoots performances with coloured paper at california's bronson caves, historically famous as the setting for many western and science fiction films. 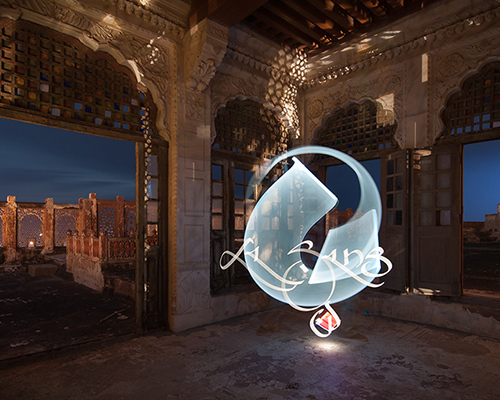 heavily drawing from traditional arabic and eastern calligraphy, the transient light forms are captured using hand-held lamps and long exposure photographic techniques. using light beyond its practicality, the artist sets up living scenarios for which he applies the photographic technique, capturing domestic and whimsical settings drawn in illuminating reds, yellows and greens. the light paintings are created by the long exposure photography of roomba vacuum cleaner robots, who have been outfitted with coloured LEDs and set free to roam. timo arnall, jorn knutsen, and einar sneve martinussen have built a measuring rod for visualizing the immaterial wifi networks in cities. the unique software for the iPad displays forms as they appear in three dimensional space.